If diagnosed in the early stages, Lyme disease can be cured with antibiotics. Without treatment, complications involving the joints, heart, and nervous system can occur. However, these symptoms are still treatable. Rarely, a person may continue having symptoms that can interfere with daily life even after they have been treated with antibiotics. Some people call this post-Lyme disease syndrome. The cause for the persistance in symptoms is unknown. People at highest risk for persistent symptoms are those who go the longest without seeking treatment. 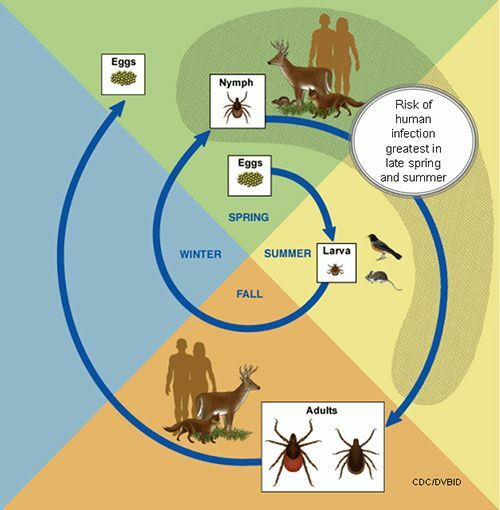 Fortunately, the rise in public vigilance has significantly reduced the rates of late-stage Lyme disease. Antibiotics given at late stages will relieve symptoms in most people, although about 5% may continue to have problems. About 60% of untreated patients develop arthritis, which usually affects the knees or other large joints. About 10 – 20% of patients develop neurological or heart problems. Patients may also experience pain or tingling in legs or arms (peripheral neuropathy), numbness, or facial paralysis (Bell’s palsy). Neurologic symptoms generally resolve and improve within a year. The main heart complications are electrical conduction problems caused by the infection, which can result in an abnormally slow heart rate. In rare cases, Lyme disease acquired during pregnancy can lead to infection of the placenta and possible miscarriage or stillbirth. Studies indicate that pregnant women infected with Lyme disease can safely be treated with antibiotics without endangering the fetus. Lyme disease is a curable condition. Nearly all patients (95%) improve after a short course of antibiotics. In very rare cases, patients continue to complain of persistent non-specific symptoms, such as fatigue, muscle aches, cognitive problems, and headache lasting years after completing antibiotic treatment for the initial infection. This syndrome, which resembles chronic fatigue syndrome (CFS) or fibromyalgia, is referred to as post-Lyme disease syndrome. In the past, it has been called “chronic Lyme disease.” However, based on many reviews of scientific literature, researchers and doctors strongly believe that Lyme disease does not have a chronic state. According to the 2006 guidelines from the Infectious Diseases Association of America, post-Lyme disease syndrome is the preferred name for this condition. Patients are considered to have this syndrome if they still have symptoms 6 months after treatment. Most important, there must be definitive evidence that the patient was originally infected by the B. burgdorferi spirochete. If there is no documented evidence of infection, it could be that the patient never had Lyme disease, or may be experiencing a new or different type of illness. If the patient did have Lyme disease, symptoms should eventually resolve without additional antibiotic treatments. Antibiotics are not helpful for post-Lyme disease syndrome.